As we continue to cover the Middle East crisis, I wanted to give an update as to my current understanding of regime security throughout the Middle East in light of the current protests that seem to be spreading throughout the entire region. We've discussed briefly some of the reasons behind the protests, and these geopolitical forces will generally apply to countries besides Tunisia and Egypt. Below, I've summarized the countries of the greater Middle East* and taken my best shot at assessing the risk to the regime based on the current level of protests and the greater structural factors behind the unrest in the country. In addition, I've color-coded the countries by risk on a map here. I'm happy to release the map into the public domain (this means you can use it as you wish, though I do appreciate credit). The low attention span summary is that despite the protests, very few Middle Eastern countries face significant risk of regime change. Yemen is likely to see a change in government, and Algeria and Bahrain face an unclear future, but other regimes are relatively secure. -Saudi Arabia: I mention Saudi Arabia due to a surprising lack of unrest. As extremist violence has grown in the country, house Saud has struggled to balance its need for stability with calls for reform, but so far it has managed its oil wealth well enough (and dealt with extremism with a sufficiently fair and progressive hand) that it seems to have warded off too many fundamental causes of instability. -Iraq: Sporadic protests have erupted in the north and the south of the country, but not in Baghdad. Ironically, the weakness of the current government (and the factious parliamentary system of the country) means that there exists neither a scapegoat (to protest against) nor a hero (to replace him). -Jordan: Jordan has often faced demographic instability (due largely to many Palestinian refugees living within its borders), but has generally handled it with some amount of grace. The king has won approval from the opposition by sacking his prime minister and cabinet, and appointing new leaders under a long-term economic and political reformist plan. -Libya: It's tough to say just how large the protesters in Libya are; Kadafi's media control is significant. Certainly, there are protesters calling for Kadafi's removal in cities across Libya, but Tripoli seems relatively quiet compared to many other Middle Eastern capitals, and the "Day of Anger" seems to have flopped (due in part to security force intimidation). Libya is both willing to crack down hard on protesters and relatively economically secure, making overthrow unlikely. -Syria: I am wary to group Syria into the same category as Iran and Libya, but the Syrian government has made a few concessions to a relatively small and wary group of protesters, and has also taken moves to suppress the protests that show at least some nervousness in the regime. -Morocco: Morocco's liberalization efforts since the 1970's (including free trade agreements with the US and EU) have led to significant economic transformation in time. But Morocco's economic fates have worsened since 2008, and this stagnation hurts particularly in a country with nearly 20% youth unemployment and high illiteracy rates. Protests have sprung up, but the regime enjoys relatively wide popular support, and the success of a relatively capitalist approach in the last few decades make alternative economic models (and their standard-bearers) less attractive. -Sudan: After the Southern Sudanese secession referendum, it seemed tempting to believe that al-Bashir might consolidate power over a now-majority Arab country. Interestingly, Southern Sudan was one of the out-groups that was helping al-Bashir hold together a fragile coalition of Arab Nationalists and Islamists. Now, both Islamists and non-Arab opposition groups are emboldened and trying to push their agenda. To hold power in the short-term, al-Bashir is likely going to have to move closer to an Islamist group he's been trying to distance, which will likely pit him against the 45% non-Arab groups of his country, leading to a prolonged struggle for the future of Sudan. 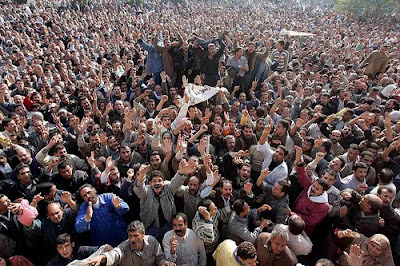 -Algeria: Food price spikes have exacerbated the unemployment in Algeria, and trade unions have joined protests demanding change. Ultimately, the number of protesters has been kept small, due in large part to security force repression. But long before the Tunisian "Jasmine Revolution," president Bouteflika has faced an increasingly strong rivalry from the Directorate of Intelligence and Security (DRS) for power. The protests give the DRS, which grew powerful during the civil war against Islamist fundamentalists, an opportunity to side with "the people" and attempt a regime change similar to the military-stewarded removal of Mubarak in Egypt. -Bahrain: Bahrain has one fundamental threat to its regime stability: demographics. Like pre-2003 Iraq, Bahrain is a majority-Shia country ruled by a Sunni dynasty. Unlike Iraq, it is an economic powerhouse with relatively low poverty rates and has been driving moderate reform since 1999. The current Shia community is demanding an end to alleged discrimination against the Shia population in both politics and employment. The situation may have remained low-risk, but Bahrain has become a battleground between Saudi Arabia and Iran, much like Iraq was during its sectarian civil war. Iran sees this as an opportunity to potentially create an ally in the region. Bahrain has reacted surprisingly desperately, violently driving protesters out of Pearl Square, killing 3 and injuring hundreds. Bahrain may have to depend on sustained security repression to keep the Pearl Square incident from leading to a backlash of even more protests. -West Bank Abbas is highly embattled, though this is due less with the current crisis (and the socioeconomic or demographic causes behind it), and more with the Wikileaks-prompted revelation that he planned to cede significant Palestinian territory to Israel in return for state recognition. The current wave of protest has increased pressure, but has little impact on the long-term endgame of how that will play out for the current Fatah regime. -Yemen: Massive protests in Yemen, supported by both an impoverished majority and a radical religious fringe, are likely to take down president Saleh. Massive unemployment, illiteracy, and general poverty (made worse by poor government economic policy) make Yemen a prime target for regime change. Saleh's promise of neither running for re-election nor passing the presidency to his son has done nothing to quell the unrest. -Egypt: The military is working hard to make sure the next regime is friendly (and under the military's control), without looking like it's turning a "revolution" into a coup. Expect the new boss to be similar to the old boss, but more savvy about unemployment and monetary policy. -Tunisia: Massive protests across Tunisia were led by the 30%-unemployed youth against a regulatory system that left them with no prospects for employment or advancement, and are largely credited as being the "spark" that has set off the current Middle East crisis. President Ben Ali resigned and fled the country, with the Speaker of the Parliament taking his place in an "interim" role. The Tunisian protests continue (in a reduced state, though many of the protesters have no work to which to return), and will likely not abate completely until a compelling plan to meet their demands is formed by the transitional government. *Note that Afghanistan and Pakistan are left out of this analysis--the current crisis has little to do with the significant regime risk both countries face. Mubarak stepped down as President of Egypt today, almost certainly from coercion from the Army. Due to massive pressure Egyptian protesters, everyone (Egyptian Army, CIA, protesters) thought Mubarak would step down on the 10th of February. He made it clear he had no intentions of doing so. It's unclear why he did this, but it looks like there may have been an internal struggle within the military leadership. The military's Supreme Council released a second Communique on the 11th supporting the idea of Mubarak sticking around, with the Vice President taking some undefined large share of the power (after a first Communique which implied that the army wished for Mubarak to step down). This second Communique suggests that the pro-Mubarak faction of the army had enough influence to stave off the coup and keep Mubarak in power. This faction likely hoped that the army's support (and a "gradual transition") would depress protesters and mark the beginning of the end of the demonstrations. It wasn't to be so. On Feb. 11, the ranks of protesters swelled immensely. Protesters in Suez took over government buildings, and thousands in Cairo began marching towards the Presidential Palace. 1) Risk a violent confrontation with the protesters. 2) Stand by idly and let the protesters overthrow the President, risking the collapse of the entire regime. 3) End the stand-off before it starts by couping Mubarak themselves. The massive risk of option 1 likely caused a sufficient subset of the pro-Mubarak faction of the army to defect to the anti-Mubarak faction that a consensus to coup was likely reached in the afternoon of the 11th. The third option was the safest for the army; it allowed the army to fall on the side of the vast majority of the population's wishes. It means that, while there will be a major change in government, Egypt's trust in its army will only swell, making sure that the army will be able to maintain its influence and power in the regime, no matter what happens next. The Muslim Brotherhood has been illegal in Egypt for decades. Since Mubarak began to teeter on the edge of demise, the MB has risen up to lead much of the protesting. It is certainly a large, and potentially quite influential force in Egypt. Thus far, it has been a relatively moderate force, with relatively moderate discourse. The West's fear in general is that the MB appears moderate and inoffensive only so that it could stay off Cairo's radar during the past 30 years, and that further down, there is a more strict Islamist agenda. Whether that's true is tough to say. Other MB organizations have (likely) been indirectly involved with extremist-style violence, and have generally advocated for strong Islamist states. The Egyptian Muslim Brotherhood started hitting the PR trail virtually as soon as the protests began. They maintained popularity in Egypt despite the ban, and have the potential to be a formidable force in the next round of Egyptian politics. The risk, of course, was that a power grab (especially early) could make both Western countries and the Egyptian Army sufficiently worried that anti-MB opposition might arise. Given that the Army is far and away the most powerful political group in Egypt, staying on the Army's good side will be critical to avoiding a drag-out political war. And so, the MB's media office released a statement: "We are not seeking power." They've promised to not field even field a presidential candidate in the next election, and have declared that, "we reject the religious state." In this move, the Egyptian MB has moved itself far from other Muslim Brotherhood organizations. Ultimately, the Egyptian MB no longer needs as much external help as it once did--it is no longer illegal, and enjoys great popular support in what may become a semi-functional democracy before the year is through. These moves of reassurance will keep pressure off the MB as it establishes a stronger legitimate presence, and will likely gain even more popularity by being seen as a force that exists to help the common Egyptian citizen. It's a strong enough stance that it's one the MB would struggle to pull away from (without appearing to betray its its promises). But there is certainly no reason that the MB should not field a presidential candidate in the second presidential election, nor take a significant holding in Parliament in this first election, even if it is unlikely to change its agenda in the short term. As a political scientist, I scrunch my eyebrows a bit at the current crisis in the Middle East. It tickles my sensibilities in the wrong way: can one man setting himself on fire in Tunis really bring down a well-established regional system of government? Obviously, the answer is "not on its own." More deeply, the answer is, frankly, "not at all." Generally speaking, the Realist school of political science sees events like the self-immolation in Tunis as minimally significant to the broader brushstrokes of geopolitics. What I mean is this: many folks in many countries at many times (including much of the Middle East) have set themselves ablaze, gone on hunger strike, or otherwise protested for change, and gotten nowhere. To say that the "conditions were ripe" in the Middle East under-attributes the importance of the conditions themselves. After the assassination of the Archduke Franz Ferdinand, tensions were high between the Austrians and Serbs. But the Austrians and Russians were largely ready to settle on a "March to Belgrade" by the Austrians, in which they'd simply hold the Serbian capital as the internal revolts were brought under control. Two main factors led to World War I itself: offensive war methodology (the ubiquitous and profound belief that the best defense is a good offense), and Germany's border instability and desire to create buffer zones in Central and Western Europe. Similarly, the election of Abraham Lincoln had ultimately little to do with the start of the Civil War. The Gulf of Tonkin incident had literally nothing to do with the American intervention in Vietnam. Ultimately, all these events were caused by broad geopolitical factors that small, relatively random (in the scope of world politics) perturbations like a sacrificial protest cannot meaningfully change. There will always be events that could lead to a crisis. Whether such a crisis emerges depends entirely on the geopolitical conditions going in. The Middle East is no different. The reason for the current political instability is, ultimately, financial instability caused by decades of mismanaged central planning that led to sufficient dissatisfaction with the current regimes. Oppression and suppression of alternative political groups is not a trivial point, but traditionally has not been enough in the past forty years of the Middle East to facilitate a popular change in government. Ultimately, yes: the same geopolitical forces that drove the beginnings of the World Wars, the fall of the Soviet Union--these, too, drive the changes we're currently seeing in the Middle East.